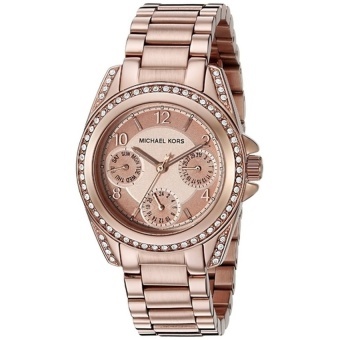 This Michael Kors rose gold timepiece features a shiny stainless steel case with stone embellishments. A stainless steel bracelet completes the look. Iconic sportswear designer Michael Kors is one of the top names in functional American fashion. After working for six years at a French fashion house, Michael Kors launched his first line of womenswear in 1981. Since then Michael Kors has become synonymous with jet-setting, ready-to-wear apparel for men and women. Michael Kors men's and women's watches carry on the tradition of runway style, while incorporating classic watch movements and materials. Popular collections utilize on-trend materials such as tortoise and rose gold, or bring a playful spin to classic bracelet and boyfriend styles. With a wide variety of timepieces for every occasion, you will be sure to find a Michael Kors watch that fits you.